Dan Parkinson (1935-2001) wrote 33 novels during his lifetime, and after I discovered one of his books in a discount bookstore, it instantly hit my favourites list! Fox and the Faith (1987) is set in the year 1777 and follows the adventures of a young Irishman called Patrick Dalton, an officer in the British navy. The Americans had begun their war for independence in 1775 as a result of several political struggles between the colonies and their British sovereign. The King of England had insisted that he had the right to tax the American people, but as British citizens the Americans wanted to have some Parliamentary representation. As Britain tried to increase its control on the colonies, the colonies tried harder to maintain some reasonable autonomy of themselves. On July 4th, 1776, thirteen American states declared their independence from the Crown. 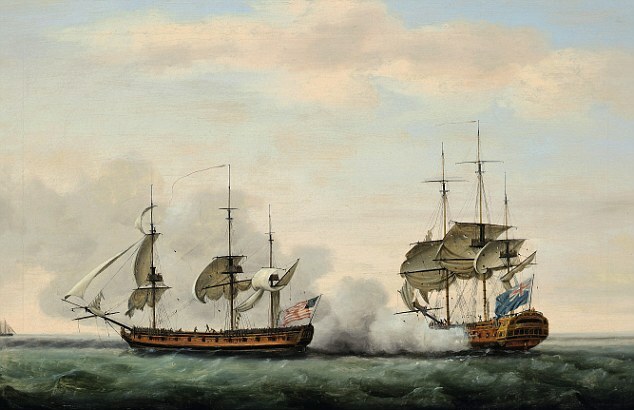 A battle between an American ship (flying the brand new flag with 13 stars and stripes) and a British merchant in 1779. Painted by Francis Holman. As the story opens, Dalton is first officer on the ship Herrett and they are heading to New York Bay to meet General Howe’s fleet. Along the way, they cross paths with a British warrant ship Courtesan, who is bringing home a prize, the schooner Faith. As they continue north, they are intercepted by two American privateers and Courtesan asks Herrett for help. Herrett is left mortally crippled from the battle and Courtesan leaves them to chase his prize and head for home. With his captain dead, Dalton brings the wreck of a ship home barely in one piece, with many of the crew either dead or injured. Now berthless, and unable to lodge a complaint against the Courtesan, Patrick Dalton happens upon an old Irish friend, Clarence Kilreagh, who manages a local tavern. Kilreagh hears that there is a warrant out for Dalton’s arrest for his previous association with the Fitzgerald in Ireland. Whilst there is no doubt of Dalton’s innocence, in these times of war there would be no proper hearing, and Dalton would be forced to await death in a prison hulk. In order to help Dalton escape, Clarence Kilreagh organises to break out a group of sailors from the Long Island stockade, held for assorted minor crimes, to crew the schooner Faith that sits alone on the bay. However, when they board the boat amidst other mayhem on the bay, they discover another small group of colonists had a similar idea. Led by a young girl called Constance Ramsey, this group was aiming to take back the ship that originally belonged to Constance’s father. They were quickly subdued by Dalton’s men and agreed to join him – if at least to escape the impending danger on the British-controlled bay! What follows is a maritime adventure of escape from the British navy, as they sail the ship up the Long Island Sound. However, as soon as Jonathan Hart, captain of Courtesan, discovers his prize vessel has been stolen, he also pursues the fleeing Faith. And once the British navy put out an order to sink the Faith, everyone – British or American, privateer, pirate or navy – are all in pursuit of the little schooner. After many sea battles, in which Dalton uses his wits and extraordinary seamanship to survive and flee, they take a much altered Faith back to Mr Ramsey in Wilmington. The crew has survived much, and now any who want to leave the Faith are able to. Constance Ramsey, having developed a tendre for Captain Dalton, reluctantly watches him leave to finally stand and fight Courtesan. An amazing battle ensues, where Dalton uses all of his wits to beat Captain Hart, and then still manages to sail his battered ship back into Delaware. Unfortunately the series doesn’t feel like it finishes. I searched for more of the books in the series and I found out that Dan Parkinson had died at the age of 66, in 2001. According to his widow, he had 2 unfinished books in his computer. I wonder if the final Fox book was one of them. I have read a bit of criticism over the historical accuracy of his books, in terms of ships and sailing terms, but seeing as I have next to no historical sailing knowledge it has not been something I have never even noticed. From what I can gather, the historical events do seem accurate, though American history is not one of my strong points! Historical maritime novels are my cup of tea! Jane Austen wrote an unpublished manuscript around 1795-ish (about the same time as Sense and Sensibility) called Lady Susan. For a description of the original story, you can read my post, Lady Susan: An eighteenth century epistolary novella. In 2005, Jane Rubino and her daughter, Caitlen Rubino-Bradway, rewrote this story as a novel and called it Lady Vernon and Her Daughter. As Lady Susan had been written in a very 18th Century manner, these authors attempted to update the story as Jane Austen may have done if she had revisited it in her lifetime. That is, they tried to make it more like a Regency romance, rather than an 18th Century moralist tale. In order to do this, the story has been changed quite remarkably from its original, making use of the idea that the way people present themselves to others is not always an accurate representation of who they really are. Lady Susan was originally portrayed by Jane Austen as a manipulative, controlling and seductive woman, willing to use other people ruthlessly to obtain her own ends. In contrast, Lady Vernon is portrayed as a misunderstood woman who is fiercely maligned and gossiped about by her so-called friends and family. So, what Jane Austen represented as fact in her story, these authors have represented as hearsay. Lady Vernon still has a reputation as a manipulative controlling person, but those closest to her – like her daughter, Frederica, and her childhood friend, Sir James – know that this is not really her. There is something really wrong – in my mind – about changing the plots of historical literature! In fact, I even struggle watching movie adaptations of historical literature because of the changes that are made to the story line. When I first began reading this book, I really hated the way the plot had been changed. 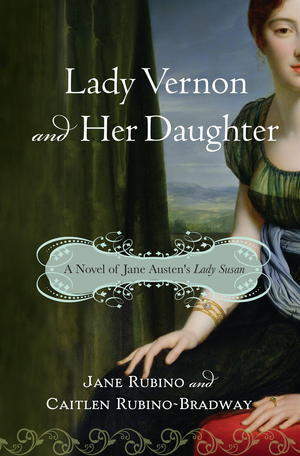 It was really difficult for me to like Lady Vernon as a character – as the authors evidently wanted me to do -, especially because Jane Austen had originally not intended this character to be liked. That being said, once I had struggled epically through half of the book (trying not to lose the motivation to finish reading it! ), I began to appreciate the clever twist to the original story. As Lady Susan was originally a epistolary novel (a novel made up of largely of letters to and from each of the characters), it is quite plausible that the characters may not have represented the truth to each other. It is even plausible that Susan may not have represented her own motives or personality accurately in her own letters. It is this plausibility that Lady Vernon and her Daughter hinges on, using it to twist the original story. So, the motives and personalities of each of the main characters are inverted. Good becomes bad, and bad becomes good. Close friendships become distant, and distant acquaintances become best friends. Those who were deceived are now in possession of the whole truth, and vice versa. One of my main criticisms of this book (aside from the unsettling changes to the original plot) is the level of character development. I got quite lost at the beginning of the story, finding it quite difficult to understand the different characters and how they differed from each other. This was probably exacerbated because of the plot changes. It wasn’t until about halfway through that I really settled into the story and felt I knew the characters well. To anyone thinking of reading this book, I would recommend to also read Lady Susan (either before or afterwards), as it does make the appreciation of the book richer. Have you read this novel? What did you think of it? How does it compare to Lady Susan? 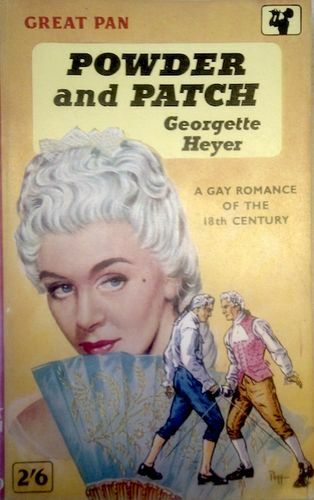 Powder and Patch (or The Transformation of Phillip Jettan), by Georgette Heyer, is my favourite book of all time. I obtained my first copy at an op-shop when I was a teenager and read and re-read it until it began to fall apart. 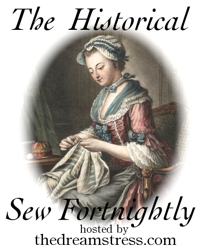 It was actually the book that inspired me to begin making 18th century costumes, as well as influencing me to begin writing again. The story is set in mid-18th century England, during the era of powdered wigs, sword duelling, tricorn hats and full-skirted coats. The plot centres around Mr Phillip Jettan, a young man living on his father’s country estate, who shows no inclination for the ways of Polite Society. His father desires him to “experience the pleasures and displeasures” of the world, thereby learning about himself and others around him, but Phillip refuses to be tempted, instead preferring to work on the estate. In the town of Little Fittledean there also lived Miss Cleone Charteris, a very pretty young woman with golden curls and eyes of cornflower blue. Mr Phillip Jettan has known Miss Cleone since they were children, but has fallen in love with her since her return from seminary school. Upon the arrival in town of Mr Henry Bancroft – a fashionable, languid, charming, mincing, flattering fop – Phillip’s qualities are thrown into the shadows. He is clumsy with words and dresses for comfort rather than fashion. His nails are unpolished and he wears no jewels, and does not even have a wig! Cleone, attracted by the graceful homage and dainty complements of Mr Bancroft, responds with her youthful gaiety. Phillip’s jealousy for Cleone’s attentions lead him challenge Mr Bancroft to a duel, in which he is easily worsted. He then proposes to Cleone, feeling certain that she would want “an honest man’s love” instead of a “painted puppy dog”, but is rejected. Whilst she loves him, he lacks the polish and finesse of a gentleman of the time and has a tendency to presume ownership of her, rather than pursuing a gallant courtship. “I do not want a – a – raw country-bumpkin,” she said cruelly. Dismayed by his rejection and knowing that he wants her for his wife, Phillip decides to go to London and then France in order to learn the arts of coquetry and fashionable manners properly. After only six months he has made a huge impression in France: he fences, speaks French, dresses fashionably, writes poetry, attends balls, and phrases pretty compliments to women – all the necessary arts of a fashionable gentleman. Mr Bancroft arrives in France, initially meeting Phillip at a rout in Paris. The tables have now been turned, as Phillip has many friends in Paris and is sought after at every fashionable gathering. He hears that Bancroft has been bandying his love’s name around and challenges him to another duel. This time he is successful, pinking Bancroft easily. Once Phillips’s father and Cleone hear of his duel “over some French wench”, he returns from Paris to London, hearing that Cleone is not at all happy that he has been engaging the attentions of other women. Meeting her at a ball in London, he deliberately plays the part of a languid, mincing town-gallant that she bade him to become, showering her with all the insincere, flowery complements of a dandy. She is initially surprised and then angry, feeling hurt that his attentions to her are indifferent and blase. To cover her feelings, she begins to flirt and court the attentions of other gentlemen, treating them with the same indifference and triviality. It all comes to a climax at a ball in London. Phillip takes a straightforward approach and proposes to Cleone again, to which she replies by elaborating on his encounters with women in Paris, accusing him of bringing her a tarnished reputation. He leaves her side, and James Winton – another friend from childhood – comes to sit beside her. Whilst she is thinking about her conversation with Phillip, she notices that James is earnestly entreating her to answer yes to his question. In impatience she replies in the affirmative, only to discover that he had been proposing to her. Once he leaves her side, a Sir Deryk Brenderby comes and takes her to a small withdrawing-room to cool herself down. Once they are there, Sir Deryk teaches her how to dice, wagering the rose at her breast. As he removes it, a locket is broken from her neck and rolls under the funriture. Upon retrieving it, Sir Deryk notices Cleone’s agitation that it be returned to her, and suggests a new wager. If she wins, she gets the locket back, and if she loses she needs to kiss him to obtain the locket. Reluctantly she agrees and promptly loses the wager. Just as she is kissing him, Phillip and James walk into the room. In order to spare Cleone the shame of being discovered in a compromising position, Sir Deryk pretends they have just got engaged, to which James replies hotly that Cleone is engaged to himself. Phillip congratulates them all and departs. In order to extricate her from two engagements, Phillip first fights a duel with Sir Deryk Brenderby and then uses his influence to persuade James to give up his suit. He then arrives at the door of Cleone’s lodgings and announces that she is free from her engagements. All that remains is for him to persuade her to marry him, which he does most masterfully. This novel is a step away from Heyer’s favourite era – the Regency – and whilst it is a relatively simplistic storyline, it was my first introduction to the world of Heyer, and even history! For this reason it has obtained a special place on my shelf. Georgette Heyer is a great writer, and I think she is especially so in her historical romances. 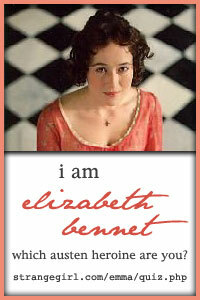 I love her mix of historical accuracy, romance and wittiness, which have often caused me to laugh out loud as I read! In a phrase, she’s my cup of tea! Powder and Patch – read an excerpt of the fateful encounter in the withdrawing room!